It was raining sideways on the day I fell in love with fire. I was in my first year of my graduate research in Environmental Studies at the University of Victoria and had traveled north for a few weeks of fieldwork at the Hakai Institute, a fishing lodge turned research station on Calvert Island. I’d planned to study soil microbes in coastal blanket bogs, but as I struggled through knee-deep sphagnum muck with water breeching my gumboots, something intriguing caught my eye—a tree burned long ago. Fire in such a soggy place seemed almost impossible, and as a former Forest Service firefighter and closet pyrophile, I needed to know more. The next day, instead of sampling soils, I staked out the burned tree and looked for more evidence of the fire. Though the rain was coming down in sheets, I convinced my research assistant that it was a worthwhile task, and we spent the whole day slogging through brushy forest trying to find the perimeter of the burn. As dusk settled, I knew I’d stumbled upon an unexpected discovery—a rainforest that had burned not just once, but multiple times. What were all these burned trees doing in one of the wettest places in North America? Was it lightning? Humans? When did it happen? I wanted to find the answer, and for the next five years I devoted my PhD to figuring it out. To understand the history of the forest, I sampled over 4000 trees with a hand-driven auger and extracted cylindrical cores, which I used to determine the age of the trees by counting the rings. The heat of a fire can leave scars embedded beneath the bark that are used to date the exact year and season of an event. Fire is thought to be rare on the rainy West Coast, but in fact, the opposite is true—it’s been part of this landscape for millennia. Unlike most places in B.C., where lightning and humans start fires in near equal proportions, it’s likely that fire in this region was entirely of human origin. First Nations may have used fire to clear land around their nearshore homes, encourage the growth of grass for game, and open dense forests to increase the productivity of berry patches. These were controlled, slow-moving ground fires that left many trees alive and kept the forest floor clear of brush—not the raging infernos we see on the news. Although evidence exists of First Nations using fire in nearby areas, up until my encounter with the burned tree, fire had never been documented on the outer islands of the central coast. Further research detailed sixteen fires over a 600-year period—and although this may not seem like much, I found that fires occurred 25 times more frequently than the previous estimates of only once every few thousand years. Despite a warming climate, fire activity ceased entirely when First Nations left the area at the end of the 19th century. The effects of First Nations forest management are subtle and not easily evident. It took years of walking through the forest—and learning from many teachers about traditional resource management practices—before I began to see the legacies. Now, I can easily identify trees that were left standing dead behind village sites through a process called girdling—where a ring of bark was removed to kill the tree above as a supply of dry firewood in the wet winter months. When I come across dense patches of huckleberries, I imagine the patch being carefully burned every few years and cared for like a garden. British Columbia’s old growth coastal rainforests are often spoken of as pristine and untouched places—and at first glance, they may appear that way. In reality, the forests encountered by early European explorers were not untouched wilderness, but carefully tended landscapes. My research has given me a deep respect for how people managed their land without degrading it, in contrast to B.C.’s resource industries over the last 150 years. I’ve also gained respect for the simple act of firemaking. On my most recent trip to Hakai, a friend tried to teach me how to light a fire the traditional way. Sweat poured down my face as I gripped a bow drill made of nettle and spruce, and spun the drill into a nest of lichen and cedar bark. After half an hour of work, the tinder finally smoked. Ten minutes later, my hands were full of blisters, I still hadn’t produced flame, and I gave up exhausted—and with a new admiration for people who made fire without lighters and matches. Though I’m nearing the end of my studies, I feel like I’m just at the start of my learning. Scientists are just beginning to discover what First Nations have known since time immemorial—and my hope is that it can help us take better care of this beautiful coast, and create a deeper understanding of other ways of knowing our world. If you drove through central British Columbia in the late summer of 2017, it would have been hard to miss the charred trees and blackened landscapes. B.C. experienced its worst wildfire season on record, with fires burning over 1.2 million hectares of forests throughout the province. In some places, interface fires spread right through communities, and over 65,000 people were evacuated from their homes. Rightfully, the extreme fire season saw wall-to-wall media coverage—and as usual, images of airplanes dropping bright red fire retardant were commonly featured. Phos-Chek fire retardant is dropped in Okanogan County, Washington in the summer of 2015. Creative commons image. Wildland-urban interface fires in B.C. are on the rise, as is the use of chemical fire retardants in the form of foams, gels, and powders. The 2017 fire season saw ~12 million litres of Phos-Chek dropped to suppress fires threatening communities in BC—surpassing the amounts used in any single season to date. The type of fire retardant most commonly used in B.C. is a concentrated liquid called Phos-Chek LC95A-MV. It contains ammonium phosphate, corrosion inhibitors, thickening agents, and iron oxide, which gives it a bright red color and makes it visible when creating fire lines. The retardant is diluted in water to 15% concentration and dropped by aircraft to aid ground crews and suppress wildfires that are threatening communities or infrastructure. Generally, fire retardant isn’t dropped directly on fires, but rather on vegetation surrounding a fire to aid in its containment or help slow its spread. Fire retardant chemicals render trees, grasses, and vegetation non-flammable by giving off water vapour and altering the combustion process of cellulose in plants. Fire retardant is more effective than water alone because it acts as a long-term fire suppressant until heavy rains wash it away. Fire retardants contain many of the same ingredients found in common garden fertilizers. Although they are United States Department of Agriculture (USDA) and United States Forest Service (USFS) approved and considered safe for humans and the environment, studies have demonstrated adverse effects on salmon and trout. Salmon at the smolt stage are vulnerable to chemical fire retardant when it’s accidently dropped over their habitat, particularly in stagnant pools and river eddies where it is not quickly dispersed downstream. Ash, mud, and debris resulting from fires can also affect waterways, but the long-term risks of fire retardant in sensitive aquatic and terrestrial habitats likely outweigh the other adverse effects of a fire event. Although Phos-Chek is sold as an environmentally beneficial product because it acts as a fertilizer after the fire, it also encourages the spread of invasive plants, which often capitalize on nutrient-rich environments. Over the years, the Environmental Protection Agency, USDA, and USFS have conducted several independent reviews to test the toxicity of Phos-Chek to terrestrial and marine environments. These reviews confirm that exposure to Phos-Chek under certain conditions is toxic to aquatic species, and have prompted laws prohibiting fire retardant drops within 100 m of waterways. Reporting is also required for all off-target drops. No independent safety approval testing in Canada exists due to funding constraints; therefore, Canada follows USDA and USFS guidelines. As a former BC wildfire fighter, I’ve been covered in fire retardant several times after gusty winds caused a missed drop by tankers. Although it caused some mild skin and eye irritation, it mostly felt like I’d been sprayed with soap. The retardant washed easily out of my clothes, but my leather boots continued to have a distinct red tinge for years. The BC Wildfire Service has been using fire retardant since the 1950s. Phos-Chek was first named in 1962; once produced by Monsanto, the family of Phos-Chek retardants is now owned by Israel Chemicals Limited (ICL). Unlike flame-retardants applied to textiles and consumer goods, which contain chemicals such as bromine and chlorine, fire retardants applied to vegetation don’t bioaccumulate in the environment. 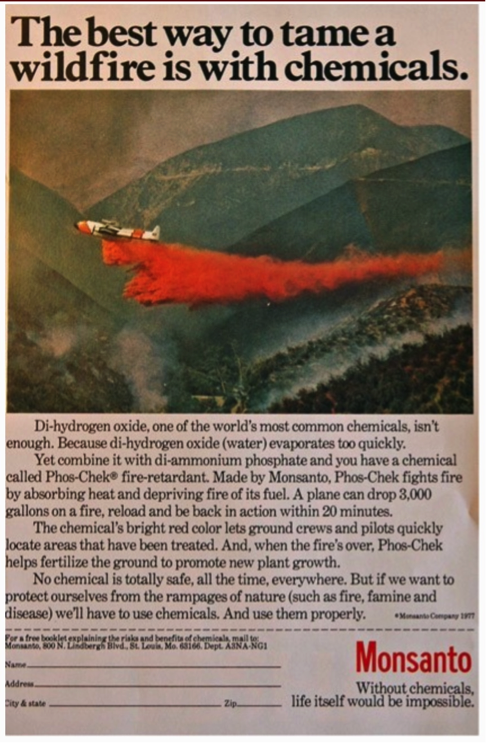 A 1977 advertisement for Phos-Chek fire retardant by Monsanto. Phos-Chek was first manufactured as a Monsanto product until it was sold to Solutia Inc. in 1998. Israel Chemicals Limited (ICL) acquired Phos-Chek in 2005. Public domain image. The amount of fire retardant dropped in a single aerial application depends on the size of the aircraft. Tanks range anywhere from 360 litres in a helicopter to 75,000 litres in a Boeing 747 SuperTanker. 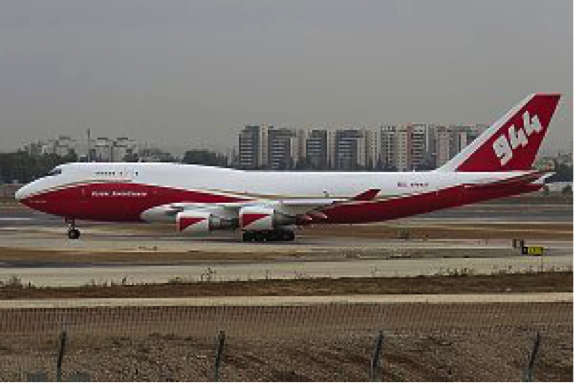 The SuperTanker made its first drops in the United States this year on the Sonoma and Thomas fires in California. The Thomas fire was the largest documented wildfire in California history, and during the 30 minutes the SuperTanker was deployed it made three fire retardant drops totalling 225,000 litres. The Boeing 747 SuperTanker refills after dropping fire retardant on a fire in Southern California. Creative commons image. As aircraft capacity to carry fire retardant has increased, along with the size of fires and the length of fire seasons, we will likely see a continued increase in the use of chemical fire retardants. Phos-Chek is currently the only retardant approved by the USDA and USFS for aerial drops; although more environmentally sound alternatives are not currently marketed, changes could be made to protect endangered species and sensitive habitat by increasing the width of the margins adjacent to waterways where retardant cannot be dropped or only using water in sensitive habitat areas. When asked about the risk of fire retardants to homeowners and their property, the answer is often something like this: “Better red than black.” If your home or property is affected by a retardant, it’s best to take precautions and remove it as soon as possible with detergent and water. And if you notice that retardant has been accidently dropped near or in waterways, don’t hesitate to report it to fire authorities. This summer, many North Americans will witness a celestial wonder—a total solar eclipse. The moon will completely cover the sun for two minutes and forty seconds. This rare sight has not been viewed from coast to coast in the United States since 1918. The relatively narrow path of totality (~120 km wide) will begin in Oregon and end in South Carolina. Because the path traverses many highly populated areas, it’s anticipated to be the most photographed and shared event in human history. The eclipse will occur on Monday, August 21, and will first be seen on the west coast just after 10:00 am PST. It will speed across the continental United States at 2,700 km/hour and arrive on the east coast 90 minutes later. The solar eclipse will last the longest and result in the greatest duration of darkness in Kentucky and Illinois. To understand how solar eclipses work, it’s best to put things in perspective. Although the sun and the moon appear to be the same size from Earth, the sun’s diameter is 400 times that of the moon. But it’s also approximately 400 times further away—from Earth, this makes the sun and the moon look nearly the same size and allows the moon to perfectly eclipse the sun, which happens every 12–18 months. This may seem like a common occurrence, but because the Earth’s surface is 70% water, it’s quite rare to glimpse a total eclipse over land. A solar eclipse occurs when the moon passes between the sun and the earth and the path of the moon either completely or partially obstructs the sun. Image courtesy of NASA. If you’re in the narrow path of totality (locations where you can view the total solar eclipse), you’ll have a chance to see the sun’s atmosphere, called the corona, which will appear like a bright white orb against the darkness for a few minutes. If this is your first eclipse, there is one important thing you should adhere to—never stare directly at the sun. If you want to view the eclipse, you can buy solar eclipse glasses, which cost $5–30 and filter ultraviolet, visible and infrared light. For information on how to view the solar eclipse, including how to make your own sun funnel and solar viewing projector, check out these informational videos. A total solar eclipse. Image courtesy of NASA. Don’t be disheartened if you don’t have a road trip planned to a location along the path of totality. The partial eclipse (when the moon covers a portion of the sun) can be viewed across North America and will last several hours depending on your location. NASA has an interactive website that can tell you exactly when to view the eclipse from any location in the world. And if it’s cloudy, don’t fret; you can connect to NASA’s live streaming event. A partial solar eclipse. Image courtesy of NASA. A multitude of airborne and ground observations will be made as the eclipse moves across the continental United States. One notable event is The Citizen Cate project, which will work with citizen scientists at 60 locations along the path of totality to document for the first time in high resolution how the sun’s corona changes over 90 minutes. This information will help scientists better understand the dynamics of the sun’s magnetic fields. If you haven’t booked accommodation for the eclipse yet, you may want to start planning now. Many vacation rentals and campgrounds along the path of totality are already full, as people will flock from all over the world to see the event. If you want to avoid the crowds, consider hiking to a less visited National Park or wilderness area, where you’ll find less noise and light pollution during the eclipse. If you want to join the crowds, events along the path include public astronomy sessions equipped with viewing stations, music festivals, cult gatherings and group weddings held in complete darkness. Whatever your interests, there’s probably an eclipse event for you. The website National Eclipse has a list of events in every state under the viewing path. In December 2014, residents of Jordan River received some unwelcome news. The 103-year-old Jordan River Dam, located 7 km upstream of this tiny seaside community on southwestern Vancouver Island, had been deemed unlikely to endure a major earthquake. The Jordan River Dam (upper Jordan River) on Vancouver Island, British Columbia (BC Hydro photo). Six years earlier, BC Hydro had commissioned a peer-reviewed study on the seismic soundness of its 79 dams in British Columbia. The Jordan River Dam was found to be the most likely of these to fail. It was believed that if this happened, the sudden release of water stored in the reservoir behind the dam would produce catastrophic flooding and destroy the community. As a result, residents were forced to sell their homes at market price to BC Hydro. The campground at the river mouth was closed, and residents received hand-delivered letters containing the promise that BC Hydro would provide compensation for their losses. With little notice and almost no public consultation, the decision had been made. On the other side of the Strait of Juan de Fuca, less than 50 km as the crow flies south, the Elwha Dam in Washington has a similar story, but a very different ending. Like the Jordan River Dam, it was built over a hundred years ago in an era of mega hydroelectric construction projects, and was heralded as a progressive structural and economic feat. Both the Jordan and Elwha rivers were blocked by two major dams, built to supply power for local communities (Victoria in B.C. and Port Angeles in WA) and support major industries such as logging and milling. The Jordan River Dam (upper Jordan River) and the Glines Canyon Dam (upper Elwha River) were once the tallest dams in their respective nations. The locations of the two Jordan River and two Elwha River dams. Map adapted from the USGS. At the beginning of the 20th century, rivers were known to possess massive amounts of energy that could be harnessed for economic gain. Little consideration, however, was given to the 10 different runs of anadromous (ocean-going) fish that relied on the Jordan and Elwha rivers to spawn. The dams on the Jordan and Elwha rivers were constructed without fish ladders and completely obstructed salmon migration. Historically, the Elwha River had annual runs of some 300,000 salmon (ten salmon species). The Jordan River had runs of about 10,000 salmon (potentially six salmon species), but it is unclear whether these estimates were established prior to dam construction or before copper and gold mine tailings heavily contaminated the river beginning in 1919. The Jordan River Dam under construction in 1910 (upper and lower left). The Glines Canyon Dam (upper Elwha) after its completion in 1927 (middle). The Elwha Dam construction camp in 1910 (upper right). The Elwha River prior to flooding the reservoir in 1913 (lower right). Images courtesy of Clallam County Historical Society and the Royal BC Museum. By the 1970s, the dams had outlived the industries they once supported, and required millions of dollars in upgrades to maintain safety. This is where the tale of the two rivers diverges. On the American side of the Strait, the raison d’etre of the Elwha dams had been rethought. In the 1980s, perspectives on rivers and environmental policy were beginning to shift and governmental bodies, including the Lower Elwha Klallam Tribe, the Department of Fish and Wildlife, and the US Geological Survey, and several non-governmental organizations concluded that the Elwha dams, which had devastated the Elwha’s native fish populations, were obsolete and should be removed. In 1994, the Elwha Act was passed by Congress, which required that both Elwha dams be decommissioned and removed to restore critical fish habitat. After 20 years of planning, dam removal began in 2011, an event documented in the film Damnation. Click here to watch a time lapse of the Elwha Dam removal. The total cost of the Elwha River restoration, including the purchase of the two dams, construction of two water treatment plants, the construction of flood protection, and a fish hatchery, was US $327 million. The estimated cost of removing the Jordan River dams was CAN $100–200 million. The Glines Canyon Dam (upper Elwha) pictured in 2014 after its removal. Photo by James Wengler. The planned demolition that breached the Elwha Dam in the summer of 2011 could be heard for miles. Three years later, the Glines Canyon dam on the upper Elwha was removed. Today, the Elwha River is still carving a new path to the Strait of Juan de Fuca. The removal of the dams has come with some hiccups—including widespread flooding in the fall and winter of 2015/16, which damaged several park facilities that had been built in the historic river channel. River restoration efforts are ongoing, but early scientific studies are clear—almost overnight, access to critical salmon habitat was restored. One week after the blast, salmon were seen spawning above the Elwha Dam site for the first time in over a century. Coho salmon are blocked from migrating past the lower Elwha dam. Image from the Seattle Times. Back on the Canadian side, as of October 2016, BC Hydro had successfully purchased the public campground and eight of the nine homes in the village of Jordan River; one resident was refusing to move. Meanwhile, salmon are still unable to move into their historic spawning grounds and water levels in the river are often too low to maintain viable habitat. Although the Jordan River was not as famed as the Elwha for its salmon runs, it was a valued salmon river. Over the last decade, salmon stocks in many B.C. rivers have been considered below normal. The depletion of salmon has been attributed to several causes, including habitat loss, and removing deteriorating dams and renewing salmon habitat would assist long-term salmon recovery. Although keeping the status quo on the Jordan River may be the simplest and cheapest short-term solution, it doesn’t answer one of the many difficult questions that B.C. and Canada are facing—how do we deal with derelict dams that restrict the free flow of rivers and cause significant ecological damage? It’s not just an economic question, it’s also an environmental one. In the longer term, who can put a price on wild salmon re-populating their ancestral homes and bringing a once-wild river back to life? They told us it was small, and they weren’t joking. When we pulled up in the middle of the night in Eugene, Oregon after a 9-hour journey from Victoria, B.C. we didn’t really know what to expect. Advertised as “not for everyone”, our first thoughts when looking at our new home amidst a grove of cedar was that it looked more like a shed then a trendy micro house in Vancouver or Tokyo. Shelter comes in many forms and at 280 square feet this 1930’s converted one-car garage was the most affordable home we could find. I’d first heard about micro houses about ten years ago and I was intrigued by their small environmental footprint, affordability and clutter-free feel. I saw the micro house movement as a way to live large in an expensive metropolitan city, but I didn’t really think it was for me. I have never been particularly drawn to small places and the idea of living in a trendy shipping container seemed claustrophobic at best. When I was offered a research term to study at the University of Oregon my husband and I jumped at the opportunity to experience a new city and explore the Oregon Coast. After a few months searching for a place to live and being less than thrilled with moldy basement suites and monthly rent that was half our combined income, I stumbled upon a listing for a little house. We rented the space from a couple whom are professional micro home builders, designing spaces using sailboat quarters as a guide. Equipped with a skylight in the loft upstairs, a small deck and a two-seater couch we decided that the space probably wouldn’t threaten our newlywed status and our 6.2 and 5.8 frames. We packed our things into a storage locker, reflecting that at 10 x 8 feet, the space was actually larger than our new home and headed south on the I-5 with our few possessions in the back of our truck. Climbing up the ladder into the loft that first night, we wondered if we would ever get used to the coffin-like feeling of our new bedroom. Exhausted from travel we both drifted into a restless sleep while January rains pitter-patted against the tiny skylight window. Firstly, there is little and then there is really little and there is intimacy and then there is little house intimacy. For example, when there is no door in the bathroom and the bathroom is in the kitchen and you need to use the bathroom you must announce “I’m going to the bathroom,” with the click of the fan above the oven if you hope to get a moment of privacy. Some might see the ability to cook a meal while on the toilet or in the shower a convenience, but for us the two were mutually exclusive. We found that communication was especially important to avoid serious head bonking, toe stubbing and general frustration and confusion. Warnings such as “I am opening the fridge”, “I am on your left”, or“I am having a shower” were essential to a smooth operating household. Some other caveats of little house living that you may not be aware of are that you cannot have anyone over, so if you like to host guests this living situation may not be for you. If you have a pet that is bigger than a hamster or have nightmares about waking up in a coffin and realizing it is your bed it might not be for you. On the flip side, living small can be incredibly freeing. When your house is smaller than most people’s kitchens you have to get out and explore and that is what we did. Every weekend we would pile our gear into our truck and camp under starry skies in the high dessert or under a dense canopy of rainforest. Part hungry for adventure and part thankful for the roomy sleeping quarters of a tent or the back of our truck we would take off Friday after work and squeeze in every bit of fun before returning late Sunday night. When you don’t have a space to enjoy or a home where you putter about there is plenty of free time and it is pretty easy to make every weekend feel like a little holiday. Packing our two “fun bags” each weekend was easy because we didn’t have much and more importantly we didn’t need much. We started to wonder if we really needed all those things we put in our storage locker so many months ago. Without realizing it, we had become part of a growing trend of having vast amounts of stuff that we didn’t really use. We found that some things are really important to have, for example, you can make almost anything with a blender and a slow cooker, but probably all other kitchen appliances are superfluous. If you have a bar fridge as your only fridge you don’t waste food because it can’t hide somewhere is the back and there is absolutely no doubling up on condiments. You spend less time looking for stuff, because if you can’t find it, it probably isn’t there. We learned to be more adaptable, mobile and about the value of space. The most important lesson we learned was that if you want to increase your square footage you can do it by spending more time outside. After a winter exploring and studying in Oregon we were sad to go. In many ways we had grown to love our little house, but the truth is we never got used to showering in the kitchen, that terrible two-seater couch and the coffin-like sleeping loft that still gives us nightmares. Shelter comes in many forms and we quickly learned that starting small is a good way to make a 700 square foot home feel like a mansion. People love dolphins. Flipper and his brethren, with their permanent “smile” and happy-go-lucky reputation, are widely regarded as one of the most intelligent species on the planet. But what makes dolphins so intelligent? Are humans not so special after all? In Conversations with Dolphins, which aired on CBC’s The Nature of Things on October 13th, filmmakers Jérôme Julienne and John Jackson dive into dolphin intelligence and how their smarts can lead to astonishingly resourceful behaviours. Dramatic footage from New Zealand reveals wild orcas learning to eat stingrays while avoiding a nasty barb in the face. In Western Australia, bottlenose dolphins use a sea sponge, an animal, as a protective glove to scare up fish in coarse sand. Off the coast of South Africa, tens of thousands of dolphins cooperatively hunt massive bait balls of sardines. Along with scientific research from the wild, the filmmakers show dolphins’ apparent affinity for humans using a story about a pod of dolphins that “saves” a long distance swimmer from a shark. If we see dolphins as intelligent, human-loving creatures then this narrative makes sense. But interpreting these actions as an altruistic, interspecies miracle is partly based on our preconceived feelings about dolphins. Because an observation precedes a result does not mean that one caused the other. In statistics, a common idiom is “correlation doesn’t imply causation”. The website Spurious Correlations outlines some quirky correlated relationships to illustrate this point. To further highlight dolphins’ intelligence, the film also delves into several studies that use captive dolphins as subjects. Researchers challenge them to the classic animal self-awareness test—the mirror. An animal is presented with a mirror and tasked with showing that it can recognize the reflection as itself rather than another animal. The dolphins pass. Few other animals pass the mirror test. Only one individual elephant has ever passed. Even the smartest dogs fail. However, the mirror test is purely visual. Dogs potentially fail because their primary senses are smell and hearing. Other animals get so caught up in aggressively posturing at the mirror that they never reach a mental state to evaluate the situation calmly. Unfortunately, that evenly matched opponent in the mirror never backs down. We are testing the animals’ intelligence based on human terms. Comparing intelligence between animals is rife with bias. Studies on captive subjects differ from studies on wild subjects in important ways. A wild dolphin doesn’t have to count dots or recognize itself in the mirror. The film would have benefitted from a sceptical scientist who evaluated the studies on captive subjects. For instance, a recent Russian study, which was widely reported in the media, purported to show two dolphins having a “conversation” with each other. However, on closer review, the experimental design was flawed and the results appear less convincing. The film succeeds in its goal of demonstrating that humans aren’t the only intelligent animals on the planet. It includes stunning footage of novel behaviours in the wild, and some intriguing experiments in captive arenas. Dolphins are undoubtedly clever creatures, but we cloud our perception of a complex species by judging them through a purely human lens. Such simplistic comparisons diminish the subtleties and talents of other animals. A pigeon, not exactly the poster child for braininess, outperforms humans on certain spatial tests. So if we could have actual conversations with dolphins, we might discover that they’re smarter than we ever imagined. The bog, a field report from the day in the life of a terrestrial ecologist. A dendrochronologist counts her millionth tree ring, and nothing happens…or does it? The clock ticks as I click my mouse and stare at the computer screen. A warm breeze blows through the University of Victoria Tree Ring Lab, and it’s incredibly quiet save for the constant beep of the Velmex machine and the whirring sounds of a flatbed scanner readying tree cores for analysis. It’s a hot Friday afternoon in August, and the campus is empty. There have been many days and months like this since I set out to measure 4200 tree cores for my Doctoral dissertation on forest ecology. But today is a day like no other—it’s the day I will measure my millionth tree ring. And little by little, 1200 years of chronicled events recorded on western redcedar trees from British Columbia’s coastal temperate rainforest will become clearer. Dendrochronology is the science of tree rings and tree ring sequences. With each ring showing a specific year’s growth, it’s not just the rings themselves that are special, but also the monumental life span of rainforest species and their ability to record major climate and disturbance events. In this part of the world, large rings indicate good growing years with moderate conditions; tight rings chronicle insect outbreaks, years with extreme weather or droughts associated with El Nino cycles. Fire scars, also present within the rings, show low-intensity ground fires that injured, but did not kill, the trees. The trees are sampled with an increment borer, which removes five millimetre cylindrical cores from the trees and resembles a large corkscrew. The trees whose rings I’m counting grow on British Columbia’s Central Coast, an area that contains one of the largest remaining intact temperate rainforests in the world. Despite looking like untouched woodland, forests here have been managed by Indigenous Peoples since time immemorial. Western redcedar, also known as the tree of life, provided people with shelter, clothing, tools and transportation. People managed their forests like gardens through selective harvesting, fertilizing and controlled burning, and that long-term relationship is recorded like an annual calendar on trees that still live today. The ability to go back in time, and the potential of these trees to provide an understanding of the past, is constantly on my mind as I measure and record each ring. I suspect other researchers have shared my feelings of wonder, doubt and frustration as they’ve tried to fit, match and decipher the puzzle that is dendrochronology. The scientific quest can be lonely at times, but I take comfort in the relationships I’ve established with fellow ecologists and dendrochronologists around the world who are asking similar questions and striving to understand the past. I am using tree cores to reconstruct what the coastal forests would have looked like hundreds of years ago and to understand how, why and when people used fire as a tool to manage vegetation. The Velmex, a microscope designed to count and measure trees, beeps for the millionth time. I stop and lean back in my all-too-familiar swivel chair—after four years of studies, I’ve measured one million rings and one million years of growth. The lucky ring dates from the year 1656, embedded in the middle of a tree standing five feet tall in a bog woodland on Hecate Island. I take a moment to think of all the things I’ve learned from these trees—like the fact that big trees are often the youngest, while small trees gnarled by storms and perched on sphagnum hummocks are often the oldest, or that a tree can can give you a pretty good clue as to what the weather was like in the year 1376. I click ahead: One million and one. And then I laugh, because no one comes into the room with a bottle of champagne and a medal. Over the years, I’d heard whispers of a secret society of million ringers at dendrochronology conferences, and I’d seen blog posts questioning who really was the Lord of the Tree Rings. I click ahead again: One million and two. Maybe the Velmex beeps do sound a little different—or maybe it’s the knowledge that in the world of dendrochronology, I’ve officially become a member of the fellowship of the rings.